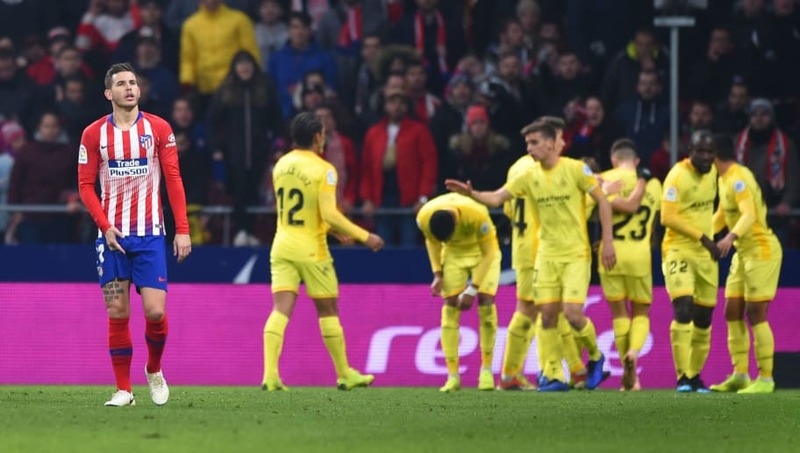 Atletico Madrid were stunned in the Copa del Rey round of 16, as a 3-3 draw with Girona saw them eliminated in a pulsating game of football. Atletico took the lead after just 12 minutes, as Diego Godin's long ball was fired home by Nikola Kalinic. Girona managed to draw level in the 37th minute, as Valery Fernandez took the ball onto his chest and volleyed home to equalise. The visitors then took a shock lead in the second half, courtesy of a bullet header from Christhian Stuani. Los Colchoneros equalised just seven minutes later, as Angel Correra slotted the ball past goalkeeper Gorka Iraizoz. Atletico went ahead six minutes from time, thanks to Antoine Griezmann's sublime finish from a tight angle. However Girona were not finished, and in the 88th minute Seydou Doumbia got a slight touch on Pedro Porro's shot to push the ball home and secure a famous victory. The 4-4 aggregate result sees Girona go through on aggregate, as they advance to the Quarter-Finals of the Copa del Rey. Atletico Madrid were completely dominant all game, and showed their control as they took the lead within the opening 12 minutes. Despite their control they didn't capitalise on their chances to kill the game off, eventually letting Girona back into the game and win the tie. They were admittedly unlucky at times, having two goals disallowed by the referee. Although they fought their way back into the game, it was not enough as Girona snatched the win at the death, leaving the hosts to look back on all their missed opportunities on what was a frustrating night. Starting XI: Adan (6); Juanfran (6), Godin (7), Gimenez (6), Arias (5); Lemar (6), Saul (6), Thomas (6), Koke (6); Correa (8*), Kalinic (7). Substitutes: Rodrigo (6), Griezmann (7), Hernandez (6). STAR MAN - Throughout the game Angel Correa was outstanding for Atletico. His work rate and determination was unrivalled by his teammates, and although the result didn't go their way his goal kept their hopes alive in an incredible game of football. WORST PLAYER - In defence Santiago Arias was shaky, and was responsible for at least one of Girona's goals. The defender didn't have his best game, as he allowed the visitors to infiltrate the Atleti defence and ultimately punish them. Girona were the underdogs on Wednesday night, though they had every chance after drawing 1-1 in the first leg. After going behind early on, it seemed that the visitors were ready to give up, and fold into Atletico's attack - but they didn't. Instead, Eusebio Sacristan's side fought hard and pushed the hosts to their limits, playing fantastic football and putting their hosts under pressure. In the end it was a hugely deserved win for the Gironistes, who pulled off a historic win at the Wanda Metropolitano. Starting XI: Iraizoz (6); Muniesa (6), Bernardo (5), Ramalho (6); Fernandez (7), Luiz (6), Granell (6), Porro (6); Garcia (6); Stuani (7*), Lozano (6). Substitutes: Doumbia (7), Pons (6), Garcia (N/A). STAR MAN - One of Girona's goalscorers, Christhian Stuani was excellent. The Uruguayan forward chased every ball, played brilliantly up front and scored a deserved goal, as he helped his side to victory in an impressive performance. WORST PLAYER - It's hard to pick out a worst performer in an incredible night, but Bernardo Espinosa had some poor moments in the game. His lack of concentration let Kalinic in for the first goal, and at times he was out of position, though it didn't matter in the end. Atletico are back in ​La Liga action on Saturday, as they travel North to face Huesca. They are then back at the Wanda Metropolitano on 26 January, when they host Getafe. Girona have until Sunday before their next game, when they face a trip to Real Betis. They then face a huge challenge on 27 January, when they welcome league leaders ​Barcelona to the Estadi Montivili.